Thanks to the Gulf Stream, Scandinavia is warmer than one might expect. Oslo and most of Norway are considered to have a mild climate, but it can fluctuate greatly from year to year in the northern regions. Except for climatic differences in the northern and southern regions, Norway's climate also varies from coastal to inland areas. While the coast tends to more consistent with mild winters and cool summers, the inland areas have the benefit of warmer summers, but considerably colder winters. Oslo is more of the latter, but still, shares some characteristics of coastal areas. The city is considered to have a humid continental climate, according to the Koppen Climate Classification System. Oslo occupies the northern end of the breathtaking Oslo Fjord. In all other directions, Oslo is surrounded by forests, ridges, and lakes. Spring sees another rapid change in the temperature, as the winter-shy sun suddenly returns to melt the snow. Technically, spring is considered to be the driest time of the year with only light rainfall, but water is, in fact, abundant thanks to the melting snow banks. Early spring is still chilly, so don’t get too excited just yet. What to pack: You'll still need your heavy coat in the spring, so don't break out the T-shirts just yet. Also, waterproof shoes are a must—while spring is dry, the streets in Oslo can be quite wet thanks to melting snow runoff. 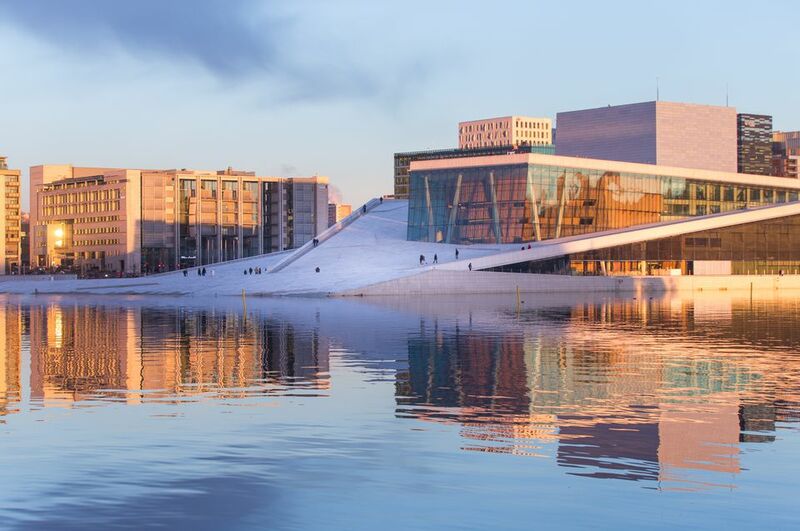 Many travelers assume that Oslo is a city of eternal winter, but Oslo is as much a city of summer and sunshine as you can hope to get in this part of the world. During summer months, picnickers and fresh air enthusiasts take to the parks and countryside to make the most of the weather. Summer weather is typically mild and pleasant, with a series of hot spells. In fact, you can expect a good deal of fine weather. July and August are the warmest months, with temperatures in the high 60s, but temperatures have been known to climb above 80 degrees Fahrenheit (27 degrees Celsius), although this happens very rarely.) As the fjord is mostly encased by land, the water temperature can get quite high for this part of the world. The wet season peaks in August when showers come down with more intensity. What to pack: Summer is pleasant and jeans and T-shirts are generally appropriate in all temperatures. Don't forget to bring a light jacket or sweater for chilly summer nights, though. The days will drastically shorten in autumn as the sun plays hide and seek in Oslo. Autumn is generally a time of rapid change, and the temperature will suddenly drop to almost 40 degrees Fahrenheit (4 degrees Celsius) in October. Rainfall is high during this season, and frost will gather during the night. Once the frost sets in, it is only a matter of time before snow sports enthusiasts eagerly await the arrival of winter. What to pack: As the days get shorter, the temperatures drop, so pack accordingly. Warm layers, such as sweaters, sweatshirts, and other cozy knits, are a must as is a good coat. Pack warm socks and boots. In the winter, Oslo is transformed into the winter wonderland that it is known for. Snow is in abundance, making the city the place to be for winter sports. Temperatures average a chilly zero degrees Fahrenheit from late November right through to March, with January as the coldest month of the year and a nippy -2 degrees Fahrenheit. Extreme cold is rare, but temperatures of -25 degrees Fahrenheit (minus 18 degrees Celsius) have been recorded from time to time. Ice develops on the inner parts of Oslo Fjord, and during exceptionally cold winters, the entire Fjord can freeze over. Things can be somewhat miserable in winter but with a little bit of initiative, there are plenty of winter activities for you to enjoy within the city limits. The weather can be unpredictable because of Atlantic winds, so it is best to come prepared for all eventualities, regardless of the season. What to pack: In the winter, pack many warm layers and a waterproof windbreaker or snow jacket—especially if you plan on doing any outdoor activities. Boots, mittens, a hat, and a scarf are also musts. One interesting phenomenon in Norway is the seasonal change in the length of day and night. Daylight lasts only about six hours in southern Norway during much of winter, while darkness prevails in the north. These dark days and nights are called Polar Nights. Conversely, in midsummer, there is very little darkness during June and July, and you'll get to experience very long days.